Tracy Bartels, director of mountain operations at Keystone, provides the scoop on construction and capital improvements taking place at Keystone this summer. Stay tuned here for regular updates on these projects throughout the summer, direct from the source! Summer is in the air at Keystone! The Keystone Golf courses are open for play, the Adventure Center and Keystone Lake are open for water activities and summer mountain operations will get underway on Friday, June 9. With a short amount of time to complete these significant capital projects by winter, we started work pretty much right after the resort closed for skiing and riding. Beginning with clearing the roads up the mountain for access to the Montezuma Express Lift and removing chairs in preparation for the lift manufacturer, Leitner Poma, to complete the removal and begin installation of the new lift this month. The existing towers and some of the chairs from the Montezuma Express Lift will be going to Beaver Creek, and at Keystone we will be utilizing the controls, the tower assemblies and some of the other components to replace and update parts on other lifts at the resort. 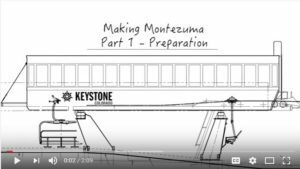 Click on this photo to check out part 1 of the “Making Montezuma” video series. Next we are looking forward to removing the old haul rope and the rest of the current Montezuma Express Lift, as well as testing the tower footers to ensure they meet the structural requirements for the new lift. In addition we’ll be breaking ground on construction at Labonte’s in the next couple weeks. 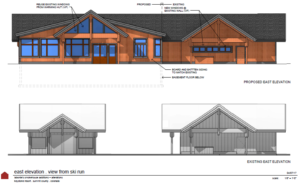 Renderings show what Labonte’s will look like next winter season. We anticipate the construction of these projects to take place throughout the summer with little impact to our mountain operations. The majority of our hiking and biking trails will be unaffected but we do anticipate having to implement some partial closures or re-routes at certain times during the summer, and we will also have to close the mountain for two days for the safety of resort guests during helicopter work on the new lift. Unfortunately the helicopter’s schedule and availability are dependent on many factors, including weather, so we are uncertain which days will be impacted right now, however we will plan to keep our guests informed of any impacts to operations throughout the summer, with as much notice as possible. We are incredibly excited to get summer mountain operations underway at Keystone on June 9, and to continue work on these major capital improvements that will further elevate the guest experience at the resort next winter. We will continue to provide construction and operations updates on the Keystone blog throughout the summer so stay tuned for further details and information, and see you on the mountain soon!